Editor’s Note: The following excerpt reproduces the text and directions accompanying the full-color cross stitch plates in Priscilla Colored Cross Stitch Book No. 2, first copyrighted in 1912. Also see the General Cross Stitch Directions originally published at the beginning of this vintage cross stitch book and Priscilla Colored Cross Stitch Book No. 1, for more directions and the first two full-color cross stitch plates. To view and print the full-sized Cross Stitch Pattern Plates, click on either of the two thumbnail pictures or the plate links below. Dainty wreaths of bright colored flowers are perhaps as pleasing, if not more so, than any designs we have for cross-stitch. They are very adaptable, both as to coloring and arrangement, and may be used on any of the cross-stitch materials with the most charming results. The larger wreath with blue roses, on the page opposite, is forty-five meshes wide. Count off this number of spaces on coarse canvas and if they measure ten inches or more, then the wreath may be worked for a sofa-pillow. Separate roses or buds can be scattered in the corners, or a plain band of two or three lines of crosses, an inch from the edge, make a pretty border around the pillow, and helps, as it were, to hold the design in. Please do NOT link directly to our images, because that costs us money in bandwidth. To share these free cross stitch patterns, please link to this page or other appropriate pages on our site instead. Thank You! On a finer weave material, this wreath makes a nice motif for the end of a scarf, and on a very fine canvas, it is suitable for a work-bag, handkerchief-case, pincushion, and numberless other articles. Other color schemes may be substituted for the blues if preferred. Either yellows or browns or shades of red will be effective, but the arrangement of the tones given in the illustration should be followed if the flowers are to retain their forms. The conventional little wreath to the right is especially appropriate for an initial on a towel end, and then to the left and right of it several of the stiff little flowers should be arranged in a border, simply repeating the flowers in line with the bottom of the wreath with about twelve spaces between. If one of the initials shown on another page is used in this wreath, it should be worked in some of the same colors that are used for the wreath. This design can be admirably adapted for an all-over pattern by merely repeating the wreaths at regular intervals with a space of only a few meshes between, and to give variety to the pattern, the flowers in the alternate repeats should be worked in different, though harmonizing, colors. The wide scattering border of bright berries and stems at the right of the page shows a corner and a repeat which may be continued indefinitely. This is a particularly pretty pattern for portieres of either heavy or soft material, and it is capable of being worked out in a variety of ways. The first thought is to work the design in simple crosses, using rich colored threads of harmonizing hues, and this is very satisfactory, but a unique suggestion for developing this pattern is to work all the green lines in cross-stitch, then use the large bright-colored wooden or porcelain beads for the bunches of berries. Sequins used in the same manner are exceedingly effective, especially if they are on a soft material. This design is good for pillows, couch-covers, curtains, lunch-cloths, and other square-cornered articles, or the corner can easily be omitted and the repeating portion used as a straight band. The narrower borders on the page are adaptable for many purposes, the lower two being suitable for filet crochet, since they express much character in their form, but this does not mean that they are unsuitable for cross-stitch, for the full beauty of the designs are brought out only in colors. The colors used for any of these patterns must depend more or less upon the color of the background which is to receive the pattern, for harmony is the key-note of success in decorating. Priscilla Colored Cross Stitch Book 2 – baskets, borders and flowers plate. Quaint little baskets of flowers or fruits enter much into the present-day cross-stitch designs, and they are used on household linen, wearing apparel, baby belongings, and novelty articles, such as cases, bags and pockets in various color combinations, usually, however, rather brilliant colors are used for the flowers in these designs, the baskets being somewhat sombre browns or drabs. The basket on the opposite page is thirty-nine meshes wide and will work up excellently on scarf ends or across the bottom of curtains. Pink flowers would be pretty instead of the blue ones, or soft lavender or clear yellow blossoms would prove effective with the slender green leaves. Also a combination of the different colors make a pleasing effect in this little basket, the shades being arranged to suit the worker’s fancy. To the left is a pretty “black-eyed-susan,” or yellow daisy border, which is to be continued repeat after repeat, for any desired length. It is twenty-one spaces wide and on a canvas of medium weave makes a most graceful band of trimming. It is best worked in the colors illustrated if it is carried out in cross-stitch, but being a decided design it also works up beautifully in filet. Below the basket is a wider border which is shown in a very pleasing color combination. This is suitable for either a horizontal or vertical border, as the flower forms are not dependent for their beauty upon the direction they are pointed. Being stiffly conventional they are good in any position. A single flower with its attendant lines of green may happily be separated from the border and used as a single motif on any single article where a bit of dainty embroidery is desired. The single lines forming the stamens are here made in Holbein stitch – single lines running with the weave of the fabric in this case. The wreath of blue flowers with its bow-knot of ribbon is a very dainty little pattern for the corner of a baby’s carriage-robe and pillow. It may also be used on the crib blanket, using Penelope canvas as a guide in making the crosses, then removing the canvas thread by thread after the work is done. Care must be taken when using the canvas this way to see that the needle does not penetrate the threads of the canvas and thus sew it to the fabric underneath. This would cause trouble in removing the canvas and would be apt to pull the crosses awry. As this blue wreath is perfectly symmetrical, the bow of ribbon can be very easily repeated on the opposite side and thus form a larger design which would perhaps be more suitable for some purposes than it now appears. In the lower left corner is a very striking pattern in rich colors. Only one-fourth of the design is given, but the matter of repeating this around the center is very simple and easy of accomplishment. When complete, the entire pattern covers a space of sixty-onne meshes, an excellent size for a sofa-pillow or square centerpiece, if a wide mesh canvas is used, or if four crosses are madein place of every one shown on the pattern. 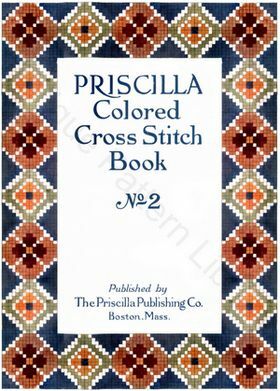 Priscilla Colored Cross Stitch Book No. 1 for two more free, full-color cross stitch plates. Scanned versions of these patterns are available as free PDF downloads from AntiquePatternLibrary under Creative Commons License Attribution-NonCommercial-Sharealike 2.5 license.